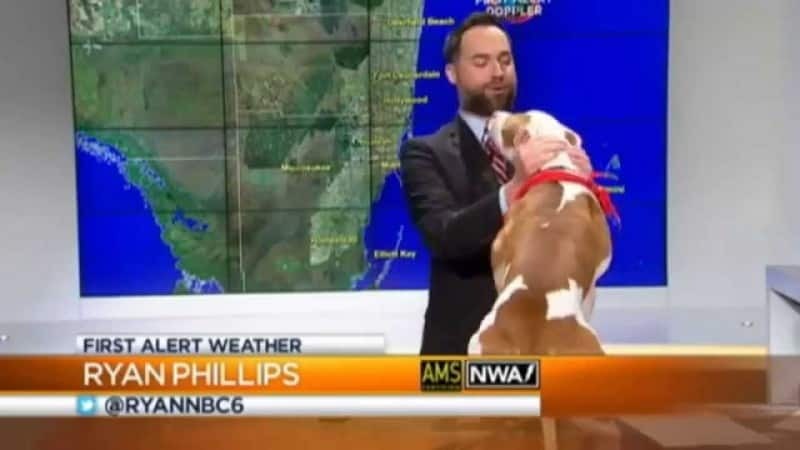 This Pit Bull decided he wanted his one minute of fame when he jumped onto the set during a local newscast while the weatherman was on live TV. The Pit named King was to be featured on the next segment of the show but just couldn’t wait and jumped into the arms of the meteorologist Ryan Phillips…much to his surprise! In the video that is on the next page you can hear the audience gasp as they were not sure exactly what would happen next. Most people have the misconception the Pit Bulls are fierce dogs and unpredictable but King is a perfect example of how loyal, kind and friendly they really are. What we love best about the video is how Phillips ad-libed the situation like a pro. He welcomed the dog and said a few funny remarks…you could see in his face that he was thinking fast. What he said at the very end is just classic! Go to the NEXT PAGE to watch this hilarious video.